For a complete chip and dip experience, serve guacamole with tortilla chips that have been tossed with lime juice and a sprinkling of salt, a signature at Chipotle Mexican Grill. Using a fork, mash avocados with citrus juice in small bowl. Add cilantro, chopped onion, serrano chilies, and salt. Stir to combine. Serve with tortilla chips, if desired. Makes six to 10 servings. en ik hou van jou! 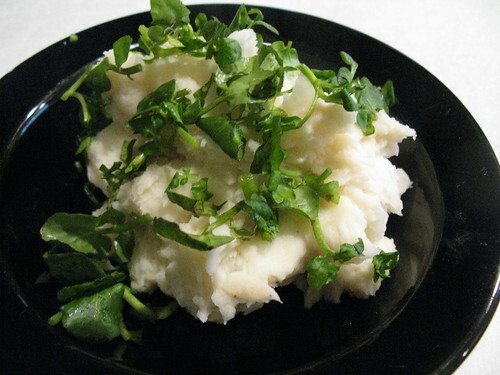 Mashed potatoes w/onions, garlic & watercress, a photo by Where is Saskia? on Flickr. Why do people look so blank, so vacant, so unnatural in portraits? Peter Hurley, a leading head-shot artist for actors, celebrities and executives, said people look like badly embalmed cadavers because they try to pose, but lack the skill to look natural doing it. Even professional models, experts at a certain haughty look, seldom know how to look natural. “I have to deprogram them into something that is more real,” said Mr. Hurley. My word, this is something. “Wuthering Heights” by Kate Bush slowed down to a 36-minute symphony of gorgeous spookiness and thrills by Looking At Blue from the Kate Bush News and Information forum.